Are they actually including the truth in the report rather than superstitions, guesses and just plane BS. If they are I can see how it would cause exploding heads among the faithful of the Church of Climatology – all their beliefs going up in smoke that isn’t warming the climate. Science isn’t supposed to be about making lurid headlines, but frontline alarmists don’t want to hear that. With the UN-IPCC backing off slightly with the extreme disaster predictions, will the ‘save the world’ and ‘climate alarmist’ political agenda soon loose it’s sciency sheen. Will Timothy Wirth type advocates’ popular political traction soon wane? Can the alarmist loudmouths now be silenced? On both counts, I hope so. Will this be enough to allow academic science, especially climate studies regain some of its lost respectability? Maybe, time and politics will tell. 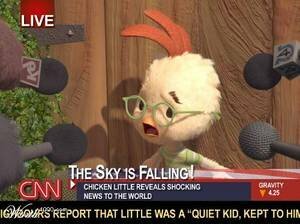 Chicken Little has been accused of pulling his punches by the Committed Alliance of Catastrophic Knowledge, a self interest group that polices wrongthink. 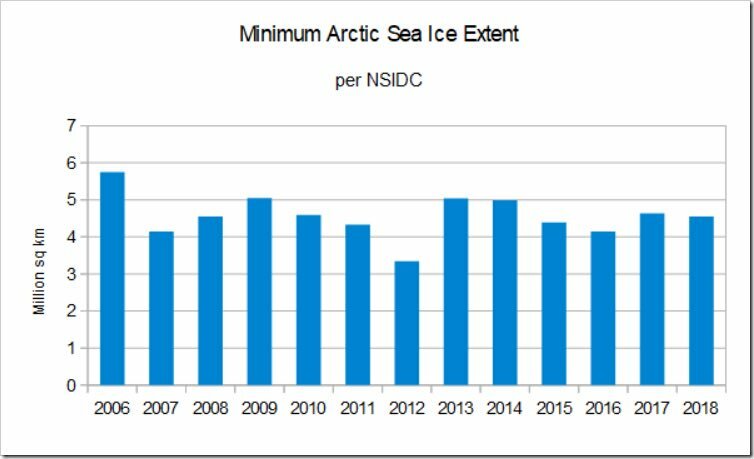 Why does the actual published NSIDC graph of minimum Arctic Sea Ice look nothing like the above? Never mind – I realised that the above graph is an excerpt of the record with a much shorter time range. If you look at the whole record on the NSIDC site then the long term trend is clearer. TDR – yes, but 1979 was a high point in Arctic sea ice, relative to the previous period. The Arctic seems to be warming up. more interesting. Ice conditions were exceptional. north ever reached with modern oceanographic apparatus. The satellite record is too short to be called long-term IMO. I call long term in the case of ~40 years of contiguous records, the entire record. If you look at that record the long term decline in ice volume is clear, and the minimum extent on record is 2012. I cant hold much value in or draw any conclusions from a single observation at a single point in time from the 1920s, but noted. I would also note from the long term temeprature record that average global temperatures were also increasing in that period. region of 1865 to 1917. Many old landmarks are so changed as to be unrecognizable. are now often moraines, accumulations of earth and stones. OK, so a single comment at a point in time from a single person that claims long term historical experience. It is well known that long term human perception is not a reliable or scientifically accurate measurement method. And even if his comments were accurate, Im not clear what your point is – Temperatures were rising then too. The point is there are ups and downs. In the early 1970s there was a lot of talk about a new ice age being around the corner. Yes, natural short term variations are normal (weather). 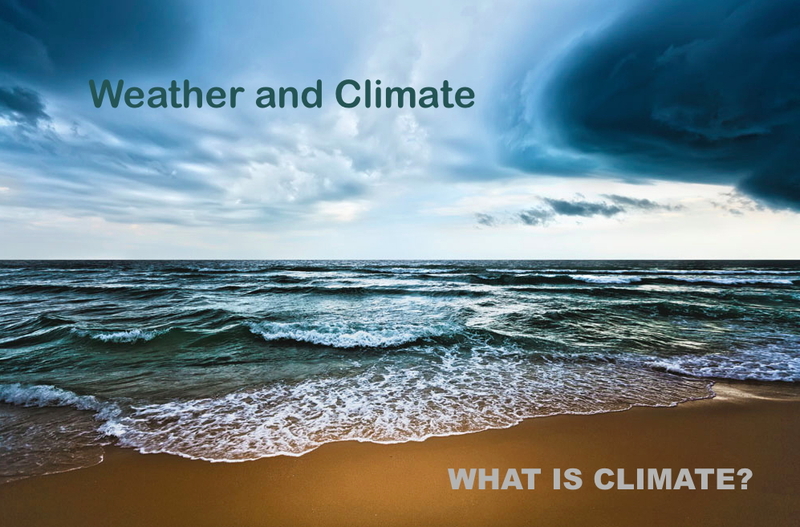 It’s long term weather trends over decades that are more statistically significant (climate). nb – there was never any scietific consensus on “a new ice age being around the corner”. Or overwhelming observable evidence for it. apparently they want to extend their fief and cash flows so they are toning down the alarmism. I’m still waiting for the handcuffs to be slapped on various ‘scientests’ and pols for the billions of wasted money and crony theft of tax money related to this scam. TDR says: It’s long term weather trends over decades that are more statistically significant (climate). TDR says nb – there was never any scietific consensus on “a new ice age being around the corner”. Or overwhelming observable evidence for it. Two things, 1) science is not done by consensus – that is religion. 2) likewise there is no overwhelming observable evidence for man made climate change – yes, the climate is changing as the earth moves from the last ice age. An article claiming a landmark report on the consequences of warming past 1.5C had been watered down at the behest of big polluters has been slammed by authors. “What Bob thinks [is] skewed others do not,” said [climate physicist] Forster. Sorry but science IS generally done by consensus. Once enough people agree with a theory and enough evidence exists for it, it becomes accepted fact until that changes. Such as the theory of gravity or of CO2 being a greenhouse gas which has been known for over a century..
@TDR you are really clutching at straws using a comic, where the guy follows the cagw mantra, as evidence and how do you get temperatures out of ice cores? nb – the graph above on Greenland uses temperatures from the top of the Greenland ice sheet. This data ends in 1855, long before modern global warming began. It also reflects regional Greenland warming, not global warming. Yes because that historical CO2 is not caused by anthropomorphic activities, but by the warming of the planet due to Milancovitch cycles.